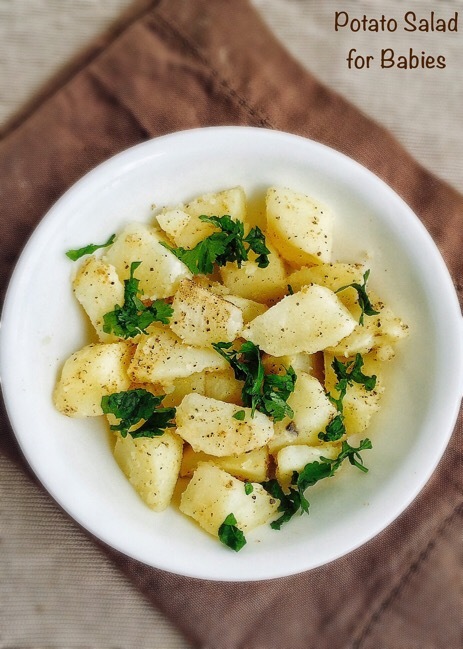 Potato Salad - easy and filling salad for babies with boiled potatoes and mildly flavoured spices. Wash the potatoes well in running water. Then add the washed potatoes required amount of water pressure cooker. Close the lid and pressure cook it in low medium flame for 4 whistles. Open the cooker once the pressure released. Let it cool down. Peel the skin of potatoes and chop them to medium sized cubes. Set aside. In a wide mixing bowl, add cumin powder, pepper powder, lemon juice and required salt (if using). Mix well. Now add the chopped potatoes to the mixing bowl. Mix carefully without breaking the potato pieces. Top the salad with chopped corainder leaves if you prefer.